As Trump continues to pick up delegates via his primary wins, his path to the Republican nomination grows clearer. There are many reasons for anyone who is not a white male to be terrified of a Trump presidency. It is inconceivable that the racist, sexist rhetoric will not embolden those with the most power and the most hate in the country to violence. 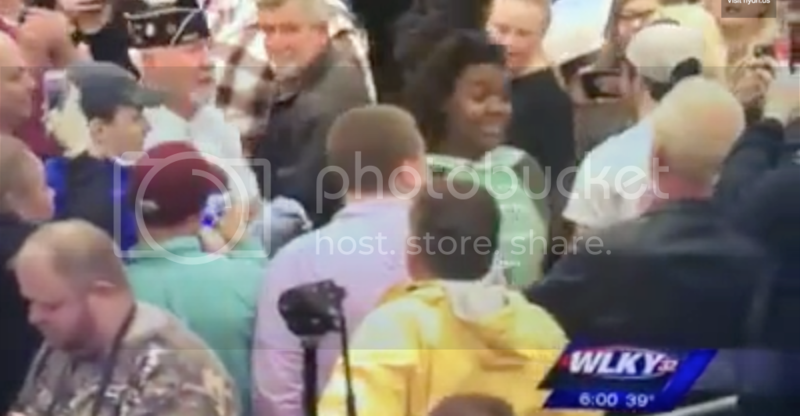 That violence was on full display when a Black woman was forced out of a Trump rally in Louisville, Kentucky. In the short clip, you'll see a woman who was said to be protesting trump being shoved by at least half a dozen men. She remains remarkably calm until an older man yells and pushes her. This should never be allowed to happen, but we, of course, cannot expect Trump or his supporters to decry the violence.